Intermolecular bonds are the attractions between the negative and positive ends of neighbouring molecules. Many molecules have a positive end and a negative end. When these molecules are near each other, they arrange themselves so that the negative and positive ends line up. The charges attract each other and hold the two molecules together. Chemists call this attraction a dipole-dipole force. Other molecules, such as iodine, do not have these charges. There may be at any given instant a greater electron density on one iodine atom than on the other. The temporary and instantaneous charge distorts the electron cloud in a neighbouring iodine molecule. The induced charge leads to a weak attractive force. 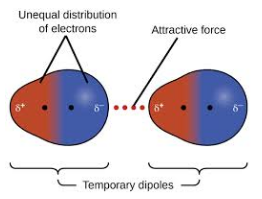 Chemists call it an induced dipole-induced dipole force or a London Dispersion Force. It is the weakest of all the intermolecular bonds.